Protection Island on the west coast of Canada is a small bedroom community that “protects” the city of Nanaimo’s harbour. There are no paved roads and most residents walk, use bikes or golf carts to navigate the island. Protection is famous for the Dinghy Dock Pub which is North America’s only floating pub. On a recent visit to the island, I was fascinated by the original and creative gateways that the locals have created to mark the entry to their cabins and homes and I was reminded of an earlier visit a decade before to Protection for a BBQ at a friend’s home. As it was an amazing summer night, we took some time away from the party to stroll the island. The island is not big, you can walk around it in less than an hour, but we took our time. Of course we would, and so we step through the gateway. Inside was a classic turn of the century home beautifully kept and the most amazing private gardens I had ever seen. The back side of the house was filled with raised vegetable beds bursting with late summer bounty. Manicured lawn edged the gravel path down the side yard where mature fruit trees grew, some still heavy with ripening fruit. At the front, facing the water was tailored beds of flowers reaching for the late summer sun and the most unique cement pond that filled and emptied with the coastal tidal waters. We were enchanted. 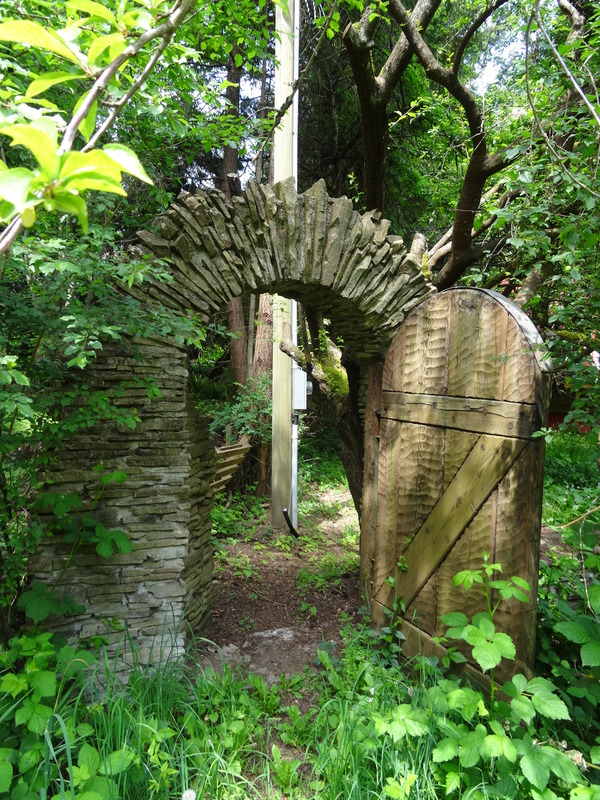 It wasn’t a hobbit’s house but I have no doubt fairies lived in this secret garden. Our host was shy but brimming with pride for his gardening achievements. He escorted us around his quaint island estate and enjoyed our awe inspired compliments and my eagerness to learn a gardening tip or two. I knew I would never forget this serendipitous experience and we thanked him heartily for the honor. And it truly was an honor because when we returned to the BBQ and told our friends about the garden tour that we had just enjoyed, they were gob smacked. The gentleman was apparently very reclusive and almost no one at the party had been inside the gate to see the gardens. Sadly, a few years later I returned to find that the gentleman had died and his beautiful garden had fallen into ruin, neglected by uncaring renters. Maybe it’s because of this gift I was given many years ago of the magical gateway garden that the gates on Protection island captivate me so. They are like silent sentinels, guarding the hidden treasures within. Much more than a property marker, each one showcasing their owners unique personality or standing as a tribute to the westcoast island lifestyle. Or maybe I just like the fact that by fashioning an entryway that is one of a kind and full of character, each property owner may have unwittingly contributed to the overall charm of this small community island that lies just 10 minutes by boat from where I live. Click on the smaller pictures to enlarge.